Saturday- We had a quiet day. It was still very cold, with morning temperatures in the 40’s. Too cold for water aerobics, outside, as there is no indoor pool here. Bob went to the hardware store to purchase some more items. I stayed home and worked on cards and cleaning the MH. We ate a lunch of leftovers, then it had warmed up enough to decorate for Christmas. Bob put up the lights. This year we made some changes and he put lights around the roof and across the front. 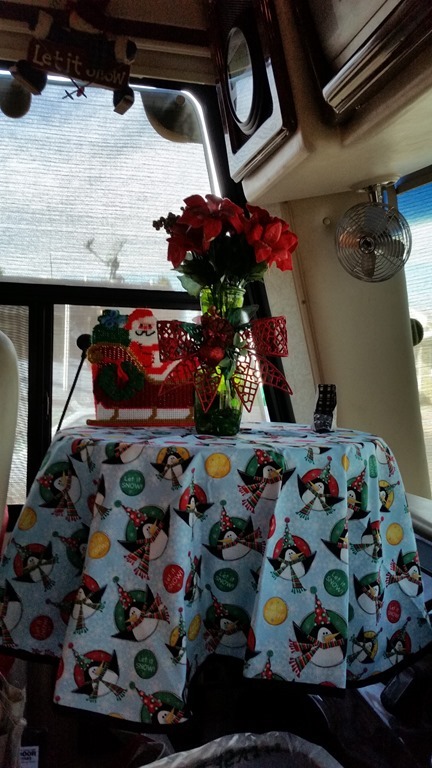 I put the Christmas table cloth on the steering wheel table and made the vase. I also had purchased a wreath. The star in the center was left over from a present last year, so I added it to this years wreath. I buy one at the dollar store and then throw it away at the end of the season so that we are not carting around a bunch of cheap stuff that I can easily replace. 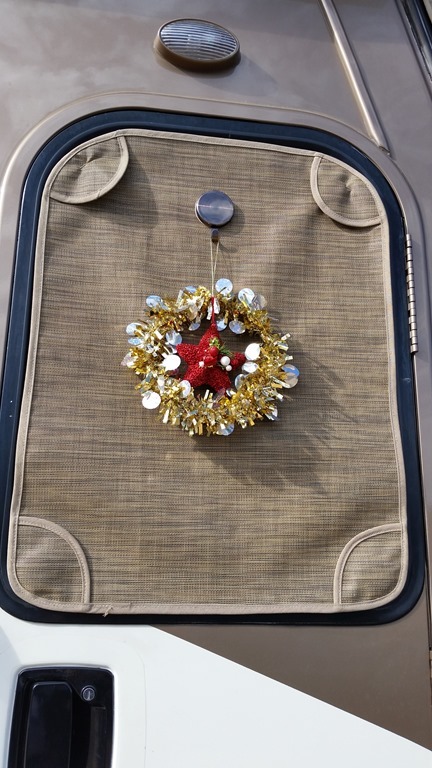 We use a magnet hook to hold the wreath in place, putting a strong magnet on the inside of the door so that the wreath stays up through the strong Arizona winds. 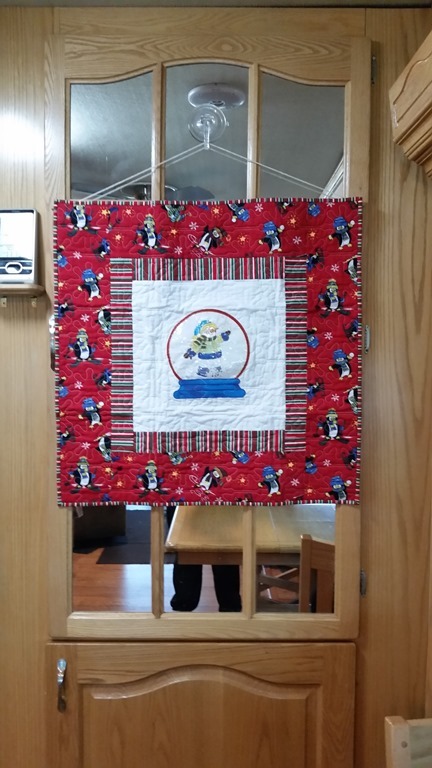 Our other big decoration is this quilted wall hanging done by friend Nikki Huffstutler. We had a quiet evening at home. Sunday- We had a nice breakfast then Bob ran to Bash’s to buy the Sunday newspaper. Lots of ads and only a few coupons. We watched the Redskin game until lunchtime, then we set up to listen to the game via Bluetooth in the car. We stopped at Jimmy John’s for subs, then Costco for gas. Our primary reason for going out during the game was to stop at Walgreens. Arizona allows companies to do blood work without a doctor’s order and Bob has been having the B12 symptoms again. A B12 blood draw costs $10, so we were having his blood tested. He is due for his shot on Tuesday, but he has been having symptoms for about a week now. We should know the results tomorrow. We returned home and did some tasks around the MH. We put a chicken in the crockpot for dinner. Unfortunately it took too long to cook, at 5:30, it was not anywhere near done. So we decided to go out to eat. We went to a restaurant called Rays Pizza. The GPS took us all over the place getting there! Coming home we drove straight home, taking half the time! Anyway, I had lasagna which I thought was pretty good. Bob had chicken parmesan which he said was just okay. We both had lots of leftovers which we brought home for another day. We ran the hydro hot all night because the temperature was dropping into the 30’s. Hmmmm, this is very cold for Arizona! Monday- It was still cold with temps high 30’s low 40’s. Usually AZ has cold nights in January, so this is really early! Hopefully it will warm up in January when we are in Quartszite. Bob took the Edge to the repair shop. We have had a problem with the drivers door. It is closed, but for some reason the car has decided it is open and keeps telling us so…. This has been going on for a few weeks, and we finally decided that it is not going away. He checked around to find a place that people like for the repairs, and made a 10 AM appointment. We hope it is just a loose wire. We can lock and unlock the car from the passenger side, just not the drivers side. I stayed home and did laundry. Worked on the Christmas letter and started working on our summer schedule. I am also getting ready for the card making class that I am running this Wednesday. Bob arrived home in time for lunch. We need a new handle for the door. The part is $400. Bob looked the issue up on the internet and this seems to be a Ford problem, since 2011. People are trying to get Ford to do a recall. We will see what happens. The repair shop had to order the part so Bob has to take the car back on Friday. We went over to the BBQ truck and bought BBQ sandwiches for lunch. I continued doing laundry and Bob took the towels over to the park Laundromat. We had a quiet afternoon. and ate leftovers for dinner. Tuesday- A busy day. No water aerobics for me. It was 38 degrees! It is supposed to warm up starting tomorrow, but it will still be cold at night. I went to Mahjongg this morning. Only MaryAnne and I . We sat talking for an hour and a half. Meanwhile, Bob was in the woodworking shop working on the box for the TV. I arrived back at the MH, and we went to lunch at In N Out burger. We stopped at JoAnnes, then went to the mall to check with the vision stores about our vision insurance. Our insurance provider is now providing a discount program for glasses. We have had BCBS for the past few years and wanted to know if we needed to continue to pay for that. It turns out that we do not. We can do better with the provided free insurance/discount program that we will have in 2016. So that is a $200 yearly savings. We can do better with the sales at the stores and the $5 co-pay for the eye exam. We checked with Visionworks, Lenscrafters, Sears and Penny’s. While in Penny’s we found Bob a pair of shorts and a shirt on sale, so we bought those. The shirt was on a table saying $9.99. It rang up $14.99. I said no, and made them check it out. The employees had put all the shirts on the wrong table, mixing them up, but we got the shirt for $9.99. They took down the sign and are going to correct their error. We stopped in at Bath and Body Works and I picked up a two year supply ( 5 for $18) of foam soap for the kitchen and bathroom. We stopped at the carwash and washed the dust off the car. We returned home and realized that we had forgotten to pick up Bob’s prescription, so we ran to Walmart, did some grocery shopping, and picked up his prescription. We returned home, stopping at the office to pick up the park newsletter and to sign up for the Christmas pot luck. We checked the mail, and there were only some park notices in our box. We pulled up at the motor home and both of our jaws dropped. My sandals had been delivered as expected and so had the TV. No signature needed? Really! Good thing our neighbors were sitting on their front porch and kept an eye on it. They were teasing us that they should have come over and taken the TV and they would have had a new one! We picked up MaryAnne, and went to Good China for dinner. Wednesday- We were up early and off to Fry’s for Senior Day. The first Wednesday of each month is Senior Day and you get an automatic 10% off of everything in the store. We arrived to see people leaving with full to brimming over shopping carts. There had already been one large van from one of the senior living communities. During the day there will be many more! We were only there to pick up some mushrooms and Boars Head sandwich meat. We returned home and Bob cooked dog food while I went to card class. I am running the class this year to give the gal who has been doing it for years a break. We made the cards and other items. I returned in time for lunch. MaryAnne did not think that there was going to be any Mahjongg today as our third and fourth persons had both said that they could not attend today. I stayed home and worked on finishing my Christmas cards. Bob is still getting the ‘box’ ready for the TV, which is still in the box. Bob called Direct TV this afternoon to request that they come out and do the set up. The equipment is free if you have a house, but if you have a MH, they transfer you to their service department. That is another company. When they answered the phone they explained that they do not handle Direct TV satellites, would we like to switch to Dish? HUH? The guy said, yea, for some reason Direct thinks of them as their service providers. So we are going to borrow a dish from Mike and use that until we can get our new dish. We went to happy hour at MaryAnne and Ray’s at 3:30. I had to leave at 5 for my mani/pedi. Thursday- I went to water aerobics. Bob worked on the TV. He made a box for the back of the file cabinet and attached the wall mount to it. 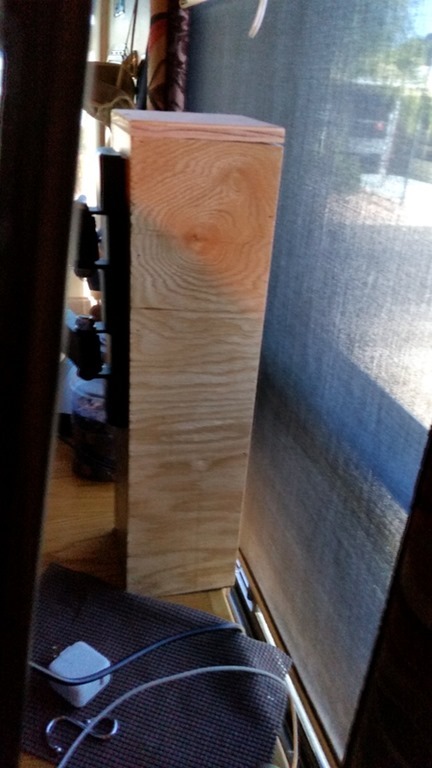 He decided that it was too tall, so he took the box over to the wood shop and cut it down some, so now it does not show behind the TV. We called Direct TV back. They said that we are not eligible for the upgrade. Huh? We were yesterday and Bob has two emails that state the offer is good until January. So we told them forget it, we will go with Dish. We were transferred to retention! We haggled with the gal, and we got a really good deal. We had to put a deposit down on the equipment that they do provide, the Genie DVR and the two Genie Mini’s we need. We still don’t have a connection for the satellite, so we are still watching the old TV. We had a quiet evening at home. Friday- I went to Card Group where we made a card with a window. I returned and Bob was still working on the TV. We ate lunch, then I went to an Estate Sale, which had a lot of craft supplies. I left there and went to JoAnnes to use my 60% off coupon. I promptly ran into Linda in the parking lot. We talked and went on our way. Back at the MH, Bob and Mike were working on setting up their extra HD satellite which we are going to use until we purchase a new roof top satellite. If you live in a house, Direct TV will come out and provide the satellite, which they did in 2010 when we first started out. We ate dinner, then went to Square Dancing. Again, we danced for 3 hours. Both of us were really tired and sore when we were done.